Following communication from CAMERA’s Israel office, Newsweek editors promptly and commendably corrected yesterday’s headline which falsely stated that Israeli police “stormed Jerusalem’s Al-Aqsa mosque.” The accompanying article, by Jack Moore, along with the sources that Moore cited (a Times of Israel article and raw Al Jazeera footage), did not support the headline’s baseless claim that Israeli troops entered the mosque. Police spokesman Micky Rosenfeld confirmed to CAMERA that the troops, who were containing violence on the Temple Mount plaza upon which the Al-Aqsa mosque sits, at no point entered the mosque. 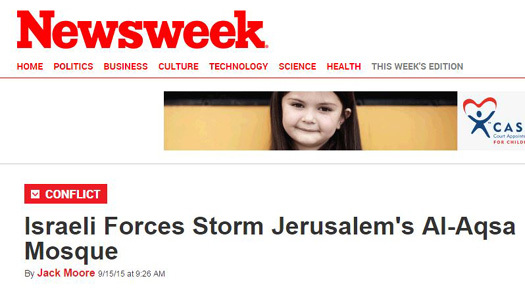 Newsweek editors today changed the headline so that it more broadly refers to “Jerusalem’s Al-Aqsa Mosque Compound,” which encompasses the surrounding entire Temple Mount plaza, an area, by the way, which Israeli troops routinely patrol. Meanwhile, over at The New York Times, the “paper of record” has yet to correct the identical error.